Yes, it's another pumpkin recipe. I promise there's more variety coming (main dishes! appetizers! recipes using apples!) but I couldn't resist one more post using pumpkin. (At least one more for now...) One of my favorite things about fall has always been pumpkin pancakes - but I've only had them at restaurants. This is a GREAT recipe that you can make and enjoy at home, and you won't even have to change out of your pajamas. The pumpkin adds great flavor and texture - everyone in my family raved about these, and said they really WERE reminiscent of pumpkin pie! 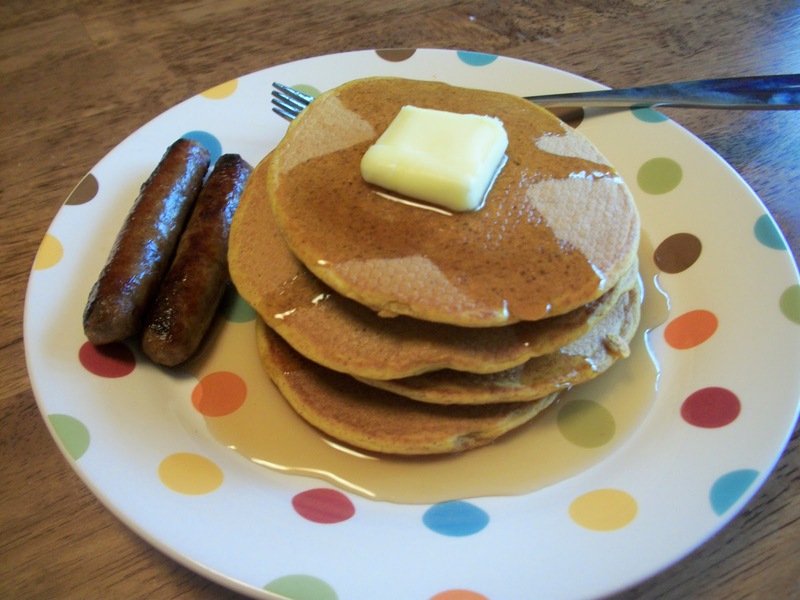 Served with warm syrup and a side of sausage links, this makes a great lazy Saturday breakfast during fall, or winter for that matter. Find more great ideas at Mouthwatering Monday, Inspiration Monday, Mix it up, Totally Talented Tuesdays, Create Link Inspire, Clever Chicks, Try a New Recipe, Tasty Tuesday. In a large batter bowl, whisk together the milk, pumpkin, oil and egg. Add the flours, sugar, baking powder, salt, cinnamon, ginger, nutmeg and cloves. Stir until just combined. Heat an electric skillet to 350 or a nonstick skillet on the stove over medium heat. Pour 1/4 cup of batter for each pancake onto the skillet; when the batter starts to bubble (about 3 minutes), flip the pancakes and cook for another 2-3 minutes on the other side. Remove the pancakes from the skillet and keep warm while repeating with the additional batter. Serve with syrup and enjoy. Makes 10 pancakes. 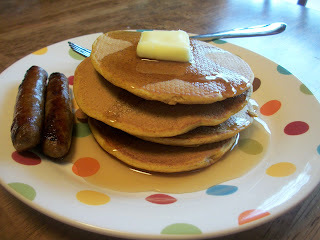 Hi, stopping by from Try a New Recipe Tuesday...I've been trying to come up with a really good pumpkin pancake recipe and am always open to trying others so I can't wait to try this one. Thank you and pinning! Perfect for Thanksgiving breakfast!!! Thank you so much for linking up at Tasty Tuesday! Your recipe has been pinned to the Tasty Tuesday Pinterest board! Please join us again this week!